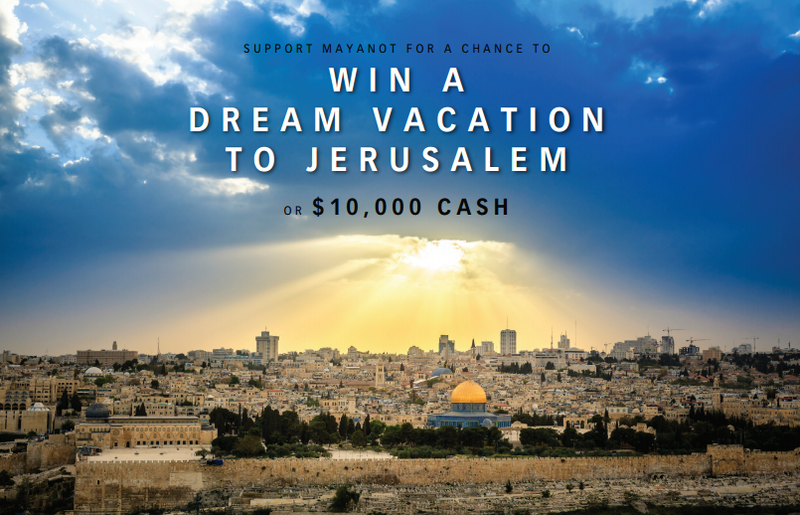 Win a trip to Israel with Mayanot’s Latest Fundraising Initiative! 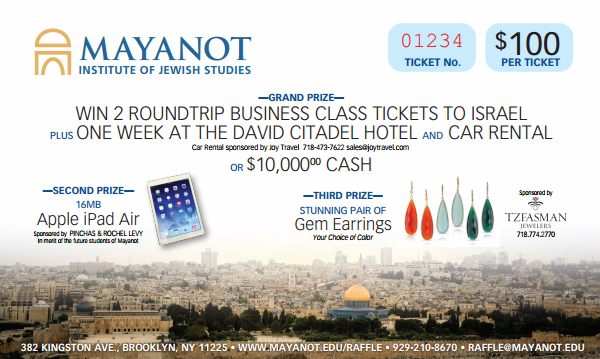 Mayanot’s latest fundraising initiative, the ‘Mayanot Scholarship Raffle’ began this past May and has had tremendous success so far. The initiative is an exciting new campaign that calls on Alumni to sell 5 tickets to parents, friends, co-workers, or acquaintances. 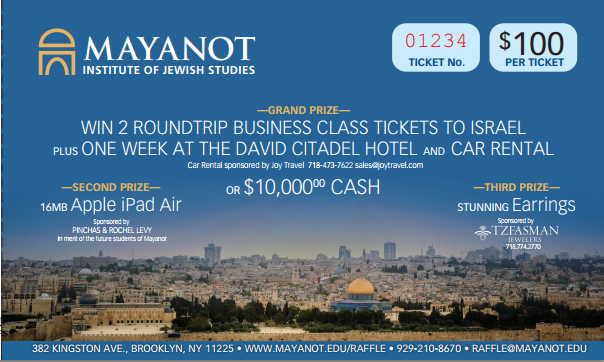 The raffle features a grand prize of a dream vacation to Jerusalem for two, which includes 2 business class tickets to Israel, a one week stay in the luxurious David Citadel Hotel and a car rental. Other exciting prizes include an Apple iPad Air and a beautiful pair of gem earrings! 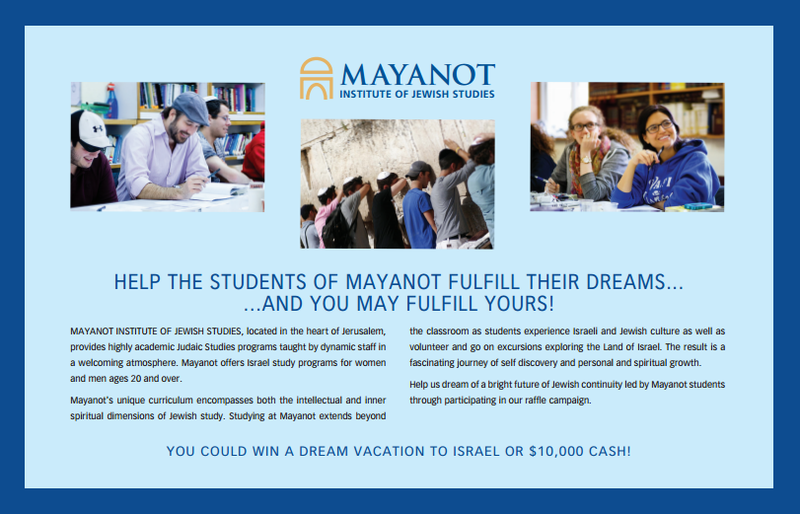 The initiative is being piloted by Rabbi Moshe Silver, project coordinator for Mayanot Alumni in the United States. Mayanot is excited by the response of alumni and friends who have been contacting and selling tickets to friends and family. We are confident this effort will allow us to offer many scholarships to our students. The benefit of helping to raise money in this way not only allows alumni and friends to take part and stay connected to Mayanot. It ensures that all students who wish to attend Mayanot will not be turned away due to financial constraints. The scholarship raffle initiative allows our alumni to help future Mayanot students and the encouraging feedback we are receiving is unprecedented. We hope to only grow from strength to strength and the Mayanot family appreciates the continued support and contributions!